As we have the first NVs here, we did a modification yesterday on the NV20s which will allow for a quick reset of the embedded AUI computer. We found that on occasion we need to reboot the AUI due to some quirk of nature. It is a PC after all. NO, this does NOT effect the operation of the transmitter. Don’t be scared. We added a toggle switch! Basically this switch will turn power off to the AUI. We chose to switch power instead of doing a reset because you never know when you need to shut her down without turning the transmitter off. The installation was simple. We have also considered connecting a switch to our remote control for the super rare case that we cannot access the AUI remotely. We have never had this situation, so we tossed the idea. I figured I would update all on the workings that occurred while we were concentrated on our Studio M build. As of today, Studio M is a big success. I think I’ll post some progress pictures on the website as soon as I can. (I have an issue at work with FTP uploads, damn firewall.) Today is the first day with live audience in the studio. They squeezed 20 people in the room. HVAC is holding up. They are loving it. Comfort level is good. He’s commenting on it as I write. While we were working on this thing there has been other items that needed taking care of. One is our Nautel V1-D. Believe it or not, our front panel overlay, which has the buttons for On/Off and LED display indications seemed to cause mysterious Off commands resulting in shutting the transmitter off. In reviewing the schematic and doing the troubleshooting with our friends at Nautel, the Off switch is paralleled with the remote Off command. This makes sense in terms of being able to override the remote and shut the transmitter down if necessary. Do to what I believe was thermal expansion and contraction we had random off-air situations do to the transmitter receiving an Off command. We eliminated the remote control as the cause leaving the overlay. Once the overlay was bypassed, the issue went away. A new overlay has been installed and all is well now. You ask, “Overlay?” Yes. It is an interesting design in that the switch is not a big, square switch, but something similar to a keyboard micro-switch, for lack of a better description. 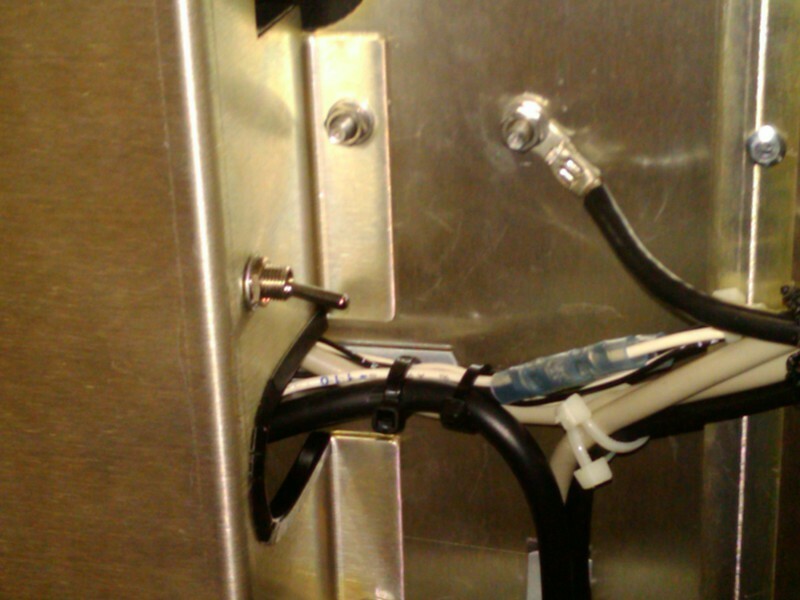 As it is part of the physical front panel, there is no way to replace or fix the switch. I am curious now if this issue will begin to surface again as the box ages. As if we had nothing else to do, we did a software upgrade on the NV20s. We moved from version 2.7 to version 2.8.3. We had no issue with 2.7, per se. We did have one, just one, occurrence where one, and only one, NV20 had an off-air situation. We took a data hit on our T-1 STL which caused a loss of AES audio briefly. The exciter did not recover, so we had a transmitter on the air with no audio. Very weird. After an exciter reboot, all was good. This issue would probably never occur again, but as a precaution we updated the software as there is a fix for this rare situation. Only three known occurrences of this from what I have heard, and of course I would be one of them! Update on the Harris Flexstar issue. We’ve been running the beta firmware for months now without incident. Our diversity delay drifts a bit, still. Our center frequency drifts a bit (last measurement was +270Hz). The real thing is we have not been off the air due to an exciter lock. No RF muting. I would say we have made significant progress on that one. As things slow down, I will request the release version of the firmware and complete the cycle. At this time, if it ain’t broke, don’t mess with it. Last, be assured I will post some details on our Studio M build. What we use and how we overcame some situations. The final decision is whether I write it up for a trade. If this is the case, then I cannot have a previous post on that that. Stay tuned. Hope you all are enjoying updates as I file them. Without getting into the details of version information as that is proprietary with Nautel, I will say we discovered a little issue with the controller on the NV20’s. Needless to say the issue did not cause much of an problem as more of an annoyance. It was a controller reset with no explanation. Random with no warning this reset would occur. I can say now that we worked this out as Nautel works on the next major release of NV software. It is quite interesting to work through these issues and provide the information necessary to catch it and fix it. I feel good that we got it as quickly as we did. Tech support on Nautel’s side was awesome. If you find your NV series transmitter randomly dropping you off the air for 2 seconds and cannot find the explanation you better give Nautel a call. The fix is there. Get it. I did drive our friends nuts as I was able to corrupt the AUI software on the transmitter itself. The fix was to ship me a new compact flash card with the “good” files in tact. Did the NV20 operate in this “mode”? You betcha. We had full remote control through the our remote control and we had full control via IP. If you are worried about such things as this with software based systems, you should be relieved to know that the important information is contained on the controller and does not fully rely on the computer running the AUI . Great job Nautel. I look forward to the next major release so I can break that! PS- Look forward to a Field Report coming to a trade near you. We officially put the first NV20 on the air today, FM + HD. After cleaning up the air chain wiring we capitalized on the things we learned this week. It is amazing the engineering it takes to make a solid state transmitter run IBOC. Linearity is the key and on these boxes it is taken to an extreme. The mask is amazing. I plan on having the second NV20 on by tomorrow afternoon. A slightly more complex chain and a bit more cleaning up. We will see how this goes. And one question that may be in your head: yes, the exciter is brand new, built from the ground up. Bright and clean. Nice full bass. You may say it is transparent. Exciters should not color audio. Finally the NV20s arrived. I must say Nautel packs them very nicely. They fit in place pretty well. I hope to have the FM-Only on by 12/31. The local delivery crew could have done better. Seems no one knows how to deliver transmitters.